– minimum weight (ie minimum length). Thus the losses of total pressure is proportional to the length. The multidimensional study instead indicates that due to the existence of a boundary layer in the presence of adverse pressure gradient, is necessary to consider long duct to get small pressure gradients to avoid the possible risks of separation. In fact in case of separation, would have greater losses of total pressure, a not uniform flow, and a reduction of the effective area ratio (the part near to the wall, due to separation, will not follow the geometric area ratio). To avoid the separation is necessary that the pressure gradient has to be lower than a value (Dp / dx)max, which it is typically determined experimentally, beyond which the tendency enhances to the separation. In practice, if we consider a dynamic subsonic Inlet with conical shape, it has been observed by experimental studies that the maximum half-opening cone angle that can be considered is of 10 degrees. Obviously this value can be different depending on the area ratio considered, and generally are adopted angles between 5 and 7 degrees. The ideal condition is that with an undisturbed air flow in entrance to the Inlet, thus M1=Ma, in this case the thermodinamic variables are equal to the enviromental ones. Generally this condition is not satisfied. Thus the external “flux-tube” will assume different shapes (divergent or convergent, with different area ratios, see figure below). From the flight Mach number Ma is possible to calculate the section of tube at infinite (at upstream), the so called “catching area” Aa. Thus M1 can be different with respect Ma. Whether M1 < Ma (for example at low speed or low flow rate) the flux tube at upstream of the Inlet is also divergent (see figure below). At low speed (or for high flow rate, that occurs at take off and in climbing fase) M1>Ma, that means the flux at upstream is convergent and the speed becames maximum at entering section A1 of Inlet. Aa>A1 implies that the flux accelerates externally, thus nullifying the aim of the Inlet that is to slow down the flux, while Aa<A1 it has to be avoided because causes an increasment of the drag. The ideal condition is Aa=A1. The parameters by means the efficiency can be calculated are. 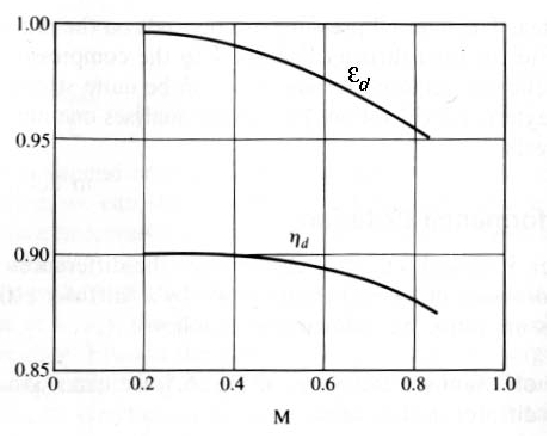 In the figure below is highlighted that the efficiency εd (as conseguence also the ηd) decreases with the increasment of Mach number. Even in this case the Inlet has to slow down the air that enters in the engine at flight speed untill the subsonic velocities (around M=0.3 -0.4) requested for the compressor (or for the combustor). By means the relation for a quasi-monodimensional isentropic flux (M>1, dFattr=0), valid for an supersonic ideal diffuser, is observable that the duct has to be convergent to be able to slow down the flux, while for a subsonic ideal diffusor, it has to be divergent. 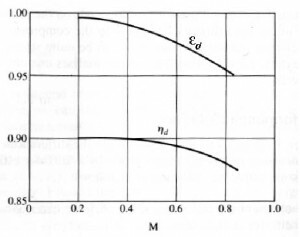 Afterward it has slowed down the flux till M=1 with a convergent duct, the deceleration has to be done by means a divergent ducts (see figure below). This solution is preferred with Mach number slightly supersonic, M ≃ 1.7 ÷ 1.8. With M≤1.5 the losses of total pressure caused by the normal shock wave are lesser than 10%, and are higher for values of M higher. When the Inlet doesn´t works within the project operating conditions the flow rate requested by the engine is different with respect the aspected one (fig 1a). If the requested flow rate is lower than the project one the losses of total pressure do not change and the Inlet draw off the excess air due a “stave off” of shock wave toward outside (fig 1b). It is necessary to avoid the super critical opereting condition when the flow rate is bigger than that requested by the project. 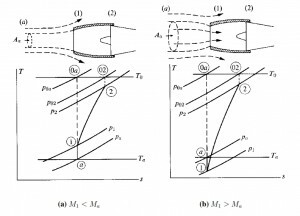 In this case the schok wave moved internally with a decreasment of total pressure p0 and therefore with decreasment of flow rate elaborated by the engine (because ṁ=Г·p0·At / (R · T0)1/2). The oblique shock wave has lesser intensity with respect the normal one. The compression occurs by means one normal shock wave or by N oblique shock waves (this esemble has the same intensity of the normal one) and it gives higher pressure ratios ε, with more shock waves N (ε -> 1 with N -> ∞, iso- entropy compression, see figure). Nevertheless by increasing the numbers of shocks the direction of the flux, that outcoming from the ramps, is more sloping with respect the axial direction. That means the losses are more high in subsonic part of fluxes, which serves to bring back the flux in the axial direction. By this consideration it is possible to determine an optimum number of shocks according to the Mach flight number. Hence this kind of Inlet are used mainly for supersonic field. 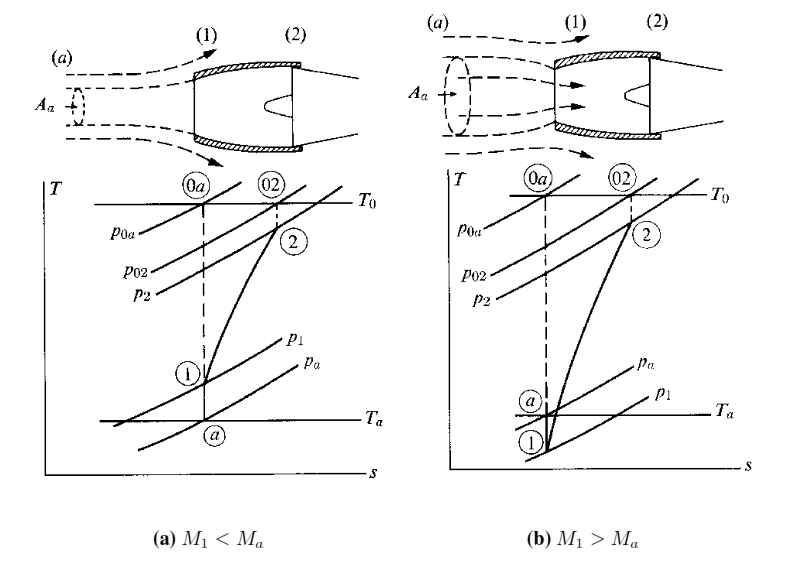 Since the compression occurs externally, in this case the flux is more adaptable for different flight condition, and thus the common problem of starting for a convergent – divergent Inlet can be avoided. As already mentioned above the length of Inlet and the rotation angle of flux (therefore weight and encumbrance) increase with the increment of the number of shock waves. The external compression can bring too wide rotations of flux, consequently losses in terms of internal strength. To avoid this inconvenient it is possible to use an Inlet with a mixed compression, wherein occurs an deceleration of flux by means a convergent duct, but whitout to reach a Mach number not unitary; afterwards the flux is decelerated by ramps that induces oblique shock waves. This entry was posted in Turbofan and tagged compression, external, Inlet. Bookmark the permalink.